The following blurb is from a Washington Post article regarding the destruction of important banking documents, vanished in the flames of an Argentine sensitive files storage warehouse, owned by Iron Mountain Inc.
A 1997 fire destroyed Iron Mountain’s corporate-document warehouse in New Jersey. 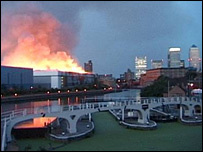 In 2006, the company’s London warehouse burned to the ground. The cause of that blaze was never conclusively determined, Iron Mountain spokesman Christian Potts said. However the London Fire Brigade blamed arson. In 2011, fire struck Iron Mountain’s document warehouse in Aprilia, Italy. It’s not enough for the term ‘Iron Mountain’ here to be associated with a bit of historical chicanery, which was the title of an alleged secret study, published in 1967 during the Johnson administration, published as: Report from Iron Mountain, a compendium of thoughts intended to deliberate the prospects of what would happen should the US fall out of a war economy into a peace economy. That someone deemed it pertinent enough to associate that same chicanery with a business model created for the storage of ‘high value’ financial documents is a tad bit suspicious. High profile Banksters committing suicide one day, with critical bank documents vanishing in flames the next. What are we to deduce from this? Were these Iron Mountain Inc. facilities designed to spontaneously combust when the going gets tuff? These can’t be coincidental….what are the chances? What else might this display of desperation be an indication of, if that in fact is what it is? Are we on the verge of a massive emerging markets currency collapse? This entry was posted in FINANCIAL TERRORISTS and tagged Bank Fraud, Banker Suicide, Farewell, Fiat Currency, Insider Trading, INSLAW, Joseph Casolaro, JP Morgan, LIBOR, Martinsburg, Octopus, Pipeline Explosion, PROMIS, Sabotage, Stuxnet, Vatican, World Bank. Bookmark the permalink.